Held at the Gulf of Georgia Cannery in Steveston, Richmond, the 2nd annual Best Catch Sustainable Seafood Festival drew plenty of environmentally conscience people out this past Saturday, September 14, 2013. Among attendees was none other than David Suzuki himself! The festival featured cooking demos, live music and exhibitors showing festival goers why sustainable seafood is important and how you the consumer can make environmentally friendly choices to protect the future of seafood. When I arrived at the festival site, I caught the tail end of Chef Robert Uy's demo. He is the Executive Chef of The Apron Restaurant at The Westin Wall Centre and he prepared a smoked albacore tuna with scallop and crab XO sauce. Beautifully smoked albacore tuna. Delicious! I love tuna and it is good to know that BC albacore tuna is considered sustainable because the fish are troll caught, a low impact, environmentally responsible fishing technique using barbless hooks. This technique helps to eliminate bycatch of species like dolphins. The next demo was by Karen Barnaby, chef, author and currently product & business developer for Albion Fisheries. She showed us how to BBQ pink salmon, donated courtesy of Albion Fisheries. Chef Karen Barnaby prepared pink salmon with maple dressing and mango salsa. Ever wonder where the seafood you eat comes from? 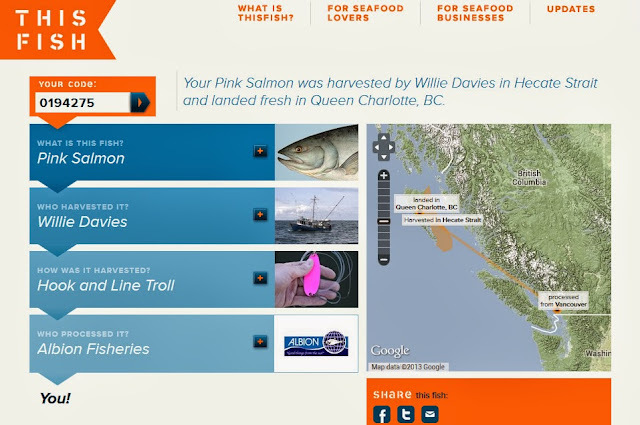 Well, this pink salmon is traceable thanks to ThisFish program. It tracks the fish starting from where, when it was caught, who it was caught by, who processed it to your plate. For example this pink salmon has the code 194275. Just enter the code on thisfish.info website and you get a result like this. Willie Davies, Captain of the vessel "Java Spirit" and a fisherman from Haida Gwaii, British Columbia caught this fish. You can even send a message to thank the fisherman on the website! The pink salmon was frozen at sea and Albion Fisheries processed it. Frozen doesn't mean yucky. Because the fish is frozen within hours of it being caught, it retains the freshness that a "fresh" non-frozen fish would. By making sure we know where our seafood comes from, we can avoid the ones that are not caught properly or with techniques that endanger the environment or if the seafood is endangered itself. Local red sea urchins are low impact sustainable alternative to more popular seafood options. They are in season from October to May and can be found 3 for $10 down at the Steveston Fisherman's Wharf. I'm not a big fan of Uni but I'll try anything. It was better than that one piece of Uni sushi I had in the past. The taste probably just needs some getting use to. Like I used to hate oysters and now I love them! Besides the cooking demos, there were a lot of informative booths set up outside and inside the cannery including Salmon Safe, Oceanwise, MSC certified seafood, ThisFish, SeaChoice, and Albion Fisheries. I thought it was a great little festival. We should all strive to be conscious of what we eat and choose only the sustainable options. Seafood is so delicious, it would be a shame if in the future was devoid of some of our favourite foods! It is worth it to make some changes in our eating habits!